Going to the dentist is daunting for anyone. Knowing what to expect for any procedure is essential. While you might want to know a bit about the process, usually the first question that is always asked is whether or not it is going to hurt. This is something you want to make sure that you know. Discomfort for dental procedures is usually kept to a minimum. They want to provide the help that is needed, but also make sure that the patient feels comfortable with everything. From start to finish, they ensure that you get all that you need. Superficial fillings usually do not require the use of numbing medications. They can be done in a matter of minutes and are easy to have done. You do not feel anything but buzzing from the drill. You are comfortable in the beginning, during and after the procedure. Fillings that are deeper into the tooth may require numbing medication. When this happens, the needle that injects the numbing medication into the gum gives off a little pinch. This is uncomfortable, but manageable. After that, you do not feel a thing in that area. This means that you just have the buzzing and feel a little cold from some water. Nothing else. Sometimes, those with sensitive teeth might have a little soreness, which over the counter pain medications can help with. This shouldn't last for more than 24 hours. Anyone else will not experience any pain once the numbing wears off. Their tooth will be like new again. Contact our office to set up a time to speak with our dental professionals. 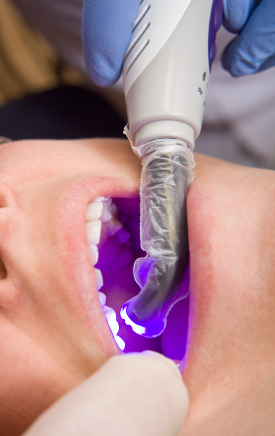 They can put your mind at ease when it comes to having fillings done. We ensure that every patient is comfortable.